Nothing Really Goes "According to Plan..." and That's Perfectly Fine. HomeYou Should KnowNothing Really Goes “According to Plan…” and That’s Perfectly Fine. I went to work at 5am this morning. It was the first time in 3 weeks that I had been to my job. It’s also the first time in 3 weeks I’ve posted anything to the website. 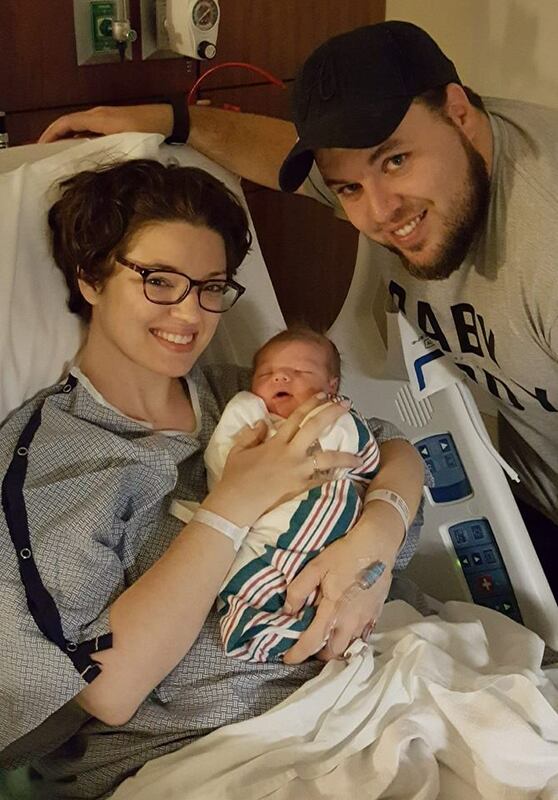 That’s because my first son, Lincoln James, was born at 8:04pm on Tuesday, May 1st. So yeah, we’ve got another member of the Winning Cures Everything family. For those that want details, he was 7lbs 7oz… and long and lean. Before he arrived, I assumed that I would continue writing and doing the podcast just as frequently as I had been. We were still in the first round of the NBA Playoffs, the NFL Draft had just finished, there was still a ton to write about spring college football (5 star QB transfers galore!! ), sports gambling was legalized by the Supreme Court, Ole Miss players that transferred were ruled immediately eligible, etc. There was a lot to write about. 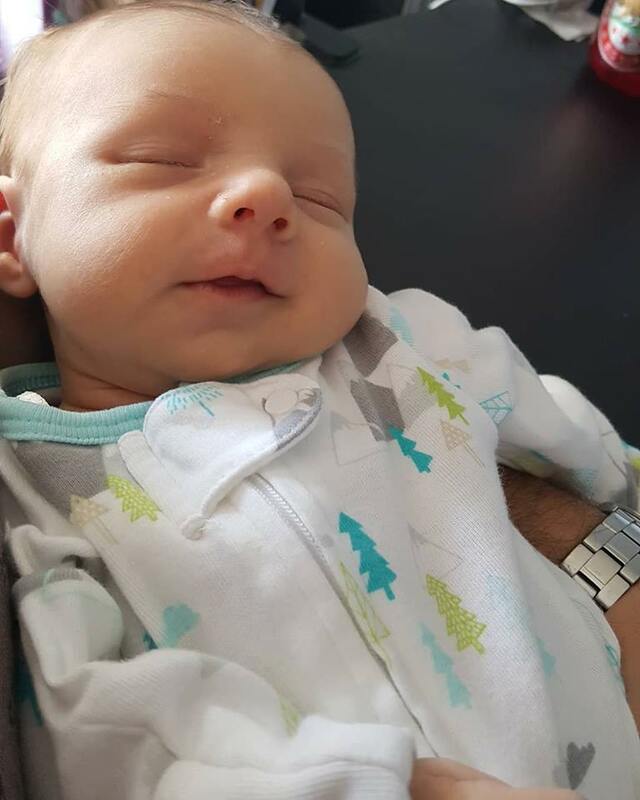 I figured “hey… he’ll be born, we’ll feed him, he’ll keep us up at night, he’ll sleep during the day, but we’ll keep a pretty regular schedule since I have paternity leave from work. I’ll go ahead and tell you about the birth. Lincoln’s due date was Thursday, May 3rd. 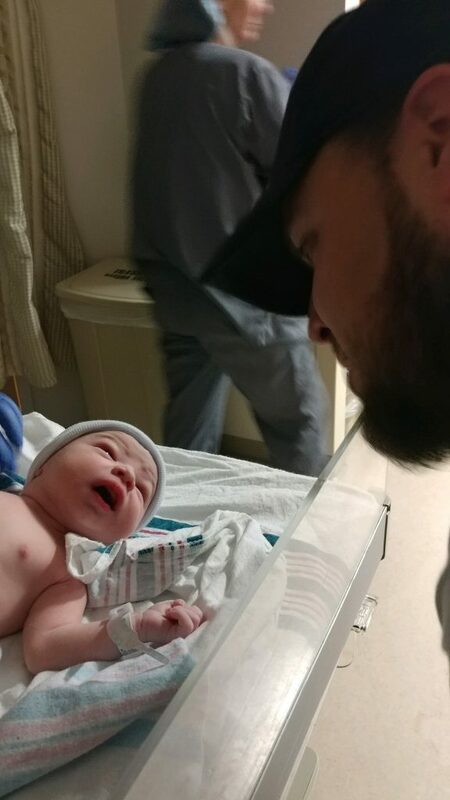 On April 5th, my wife was already really really pregnant, and her doctor told us that the baby “could be here any day now!” and that she expected him to be here before April 23rd. So for an entire month, we kinda sat on pins and needles, waiting for whenever she was going to go into labor. That first weekend in April, my wife was sick with a virus. Everytime she threw up, she had contractions, which led us to believe she might be in labor. So from that point on, we were both on edge, expecting him to arrive at any point. April 23rd came and went, so on Monday, April 30th, after Chris and I completed a podcast, she and I went to bed with the expectation that I would get up and go to work like usual. The next day was not like usual. Jess woke me up a little bit before 5:30am by saying “Gary… my water just broke.” My alarm wasn’t set to go off for another 15 minutes, and I, still in a sleeping state, looked at her and said “Cool” and flashed her a peace sign with my fingers. I haven’t given anyone the peace sign since, probably, 7th grade. What she said actually registered with me after a few more seconds, so I jumped out of the bed and started grabbing the bags for the hospital (which had been packed for almost a month). We were ready for this. Her contractions started 15 minutes after her water broke. Apparently, that’s not a common thing. It only happens to 1 in 10 pregnancies. So things were a little strange from the jump. After getting the dogs fed, and my wife jumping in the shower and trying to will herself through some of the early contractions, we finally got to the hospital around 7:15am that morning. The nurses all thought we would have a pretty quick delivery, since she appeared to be progressing quickly. Part of that progression, we thought, was the intensity of contractions. If you’re reading this and you’ve never had a child, or been with a woman during labor… this is where true love is tested. What women say during their contractions is not what they really mean. It’s the demons that have found their way into her body that are screaming at you. So I sat, on a medicine ball, outside of a shower, with my arm inside the curtain holding her hand, for 25 minutes… because when you’re a husband and expectant father, you give your wife what she wants, when she wants it. That’s the secret to a happy marriage, by the way: Give your wife what she wants, when she wants it. Pretty easy rule to live by. So, let’s go back a little bit. My wife wanted to have a “natural birth.” No drugs. No epidural. No nothing. Things did not exactly go as planned. Once we got into the 7th hour of labor, the contractions started coupling and tripling. For those that don’t know, what that means is her contractions were 90 seconds to 2 minutes of high intensity with only 30 second breaks between them. It was determined that, because she had not progressed as much as we hoped, the contractions would make her too tired to be able to push once we got to that point, so she had to get an epidural. Well, after the epidural, the contractions spaced out to 6 minutes apart (which, for you beginners, is too far apart), so the nurses had to give her pitocin to help induce the labor. None of this is what we wanted to do. It doesn’t mean we did anything wrong… it just means things did not go the way they were supposed to. Then you clean it up and keep going. So, after the pitocin, a little more prep, and 2 hours of pushing, Lincoln made his grand entrance to this world. They flopped him, like a fish, up on my wife’s stomach. He didn’t make a sound at all. The nurse grabbed him and put him under a “warmer,” and they called for more nurses. All of these plans of a natural birth, the plans for the initial “skin-to-skin” bonding immediately after birth, and the thought of getting to hold my son within the first few minutes of his life… nothing was going according to plan, and now the timer they had on top of the warmer was at 3 minutes, and he still hadn’t taken a breath. My daughter, who is now 12, didn’t breathe when she was first born either. She had swallowed meconium, but they popped that out and she started crying within about 30 seconds to a minute after being born. There were 9 nurses around my son. doctors and 1 nurse were still working on my wife. Nobody said a word to us. The clock reached 12 minutes. I was watching my son and still had not seen him take a breath. My mother-in-law was crying. We made eye contact. My eyes had welled up, and I was having trouble breathing. Earlier in the day, I had been trying to determine if I would be able to watch Game 2 of the Warriors-Pelicans NBA Playoff series in our room while holding my son. Now the clock was at 15 minutes, and he still wasn’t breathing. One of the nurses was yelling instructions at the other nurses. My mother-in-law was holding my wife’s hand. The doctors continued working on her. Time seemed to creep by slowly, yet, move incredibly fast at the same time. I couldn’t wrap my head around the idea that something went wrong during all of our preparation. I thought about what we should have done differently. We were so prepared, or so we thought. We had studied, taken birthing classes, watched videos, prepped the house, bought everything we thought we could possibly need for a baby. His nursery was already ready. Both sets of his grandparents had already showered us with gifts and helped us prepare for his arrival. Now we were at 19 minutes and he still wasn’t breathing. Then at 20 minutes and 31 seconds, I heard a noise. My wife, mother-in-law, and I all heard it at the same time. I saw one of the nurses smiling. Then I saw my son’s chest going up and down. Then we heard a louder cry. 20 minutes, 31 seconds without breathing, and, somehow, he was alive. The doctor finished working on my wife around the same time – I’m guessing he had finished a while before that, but needed to do something to keep her mind off of the situation at hand. I walked over to the warmer, and he wasn’t crying anymore. His eyes were closed, and he was breathing, while the nurses were prepping to take him to be examined. I spent many nights talking to my wife’s stomach, telling my son about the things we were going to do when he grew up, and about football, basketball, and life in general. She and I would read stories to him, etc. Turns out, my mother-in-law was right. 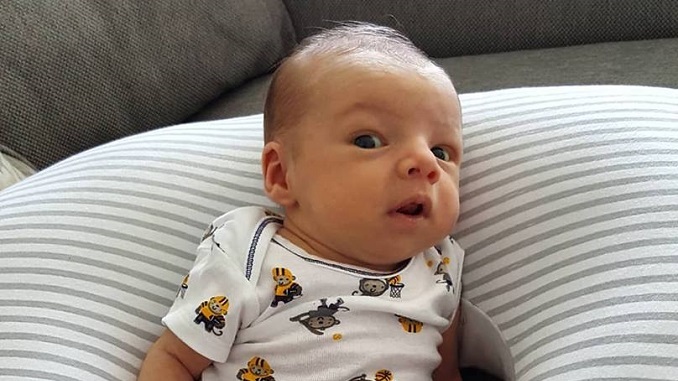 No joke, my son turned his head, opened his eyes, and looked dead at me. The picture to the left is of that exact moment. My mother-in-law was smart enough to have her camera out for that moment, not that I’ll ever forget it for as long as I live. I’m glad I’ll be able to show it to him when he’s older. The nurses swaddled him in a blanket and let my wife hold him. They told us he inhaled amniotic fluid when he tried to take his first breath, and they were able to get it out of his lungs so he could breathe, but they would have to take him to the NICU nursery to examine him and make sure he didn’t have any infections. My wife only got to hold him for about 2 minutes, and then he was gone for a little over 3 hours. But we felt ok, knowing what could have happened. Somewhere along the way, we also learned that something happened to my wife during labor, which has now led to her having to attend physical therapy twice a week, until further notice. Things we used to take for granted, like her being able to walk up the stairs by herself, or even walk across the room, are now things that take a great deal of determination. It has been 3 weeks, and her leg is getting much stronger, but it is still giving her problems, and it is a little frustrating for her… but, looking at what could have happened, if that’s the worst that came from the whole experience, then we feel pretty lucky. Her current issue isn’t permanent. It’s just a bother for a little while, and then she’ll be back to her normal fast-paced self. 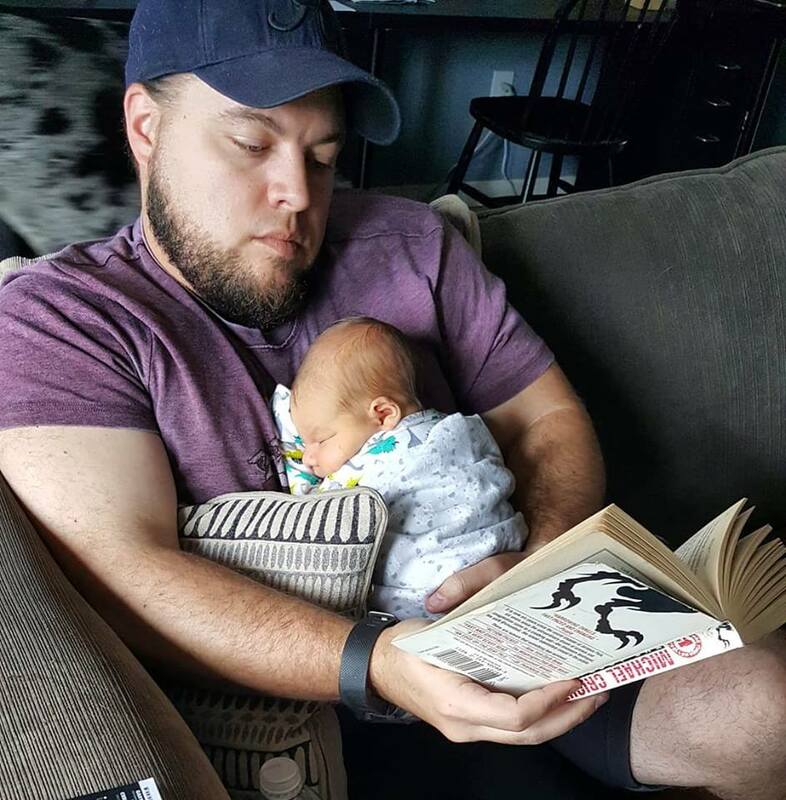 So, yeah… my initial plan was to go back to writing about sports pretty soon after he was born, and go back to doing the podcast with my buddy, Chris, at least once, if not twice, a week almost immediately. But things didn’t really go to plan. In fact, pretty much everything changed on May 1st, and that’s ok, because it is much better than what it could have been. I’ll still be writing, and I’ll still be watching games and talking about gambling, and we’ll get back to doing the podcast, but I’m glad I had the 3 weeks off to spend with my wife and son. I’ve reduced my schedule for the next 2 months to make sure I’m with my wife, daughter, and son as often as possible. The whole experience opened my eyes a little bit because, honestly, no matter how much you plan, nothing ever really goes according to plan. But with family… well, it doesn’t really matter if things go according to plan, so long as we’ve got each other.